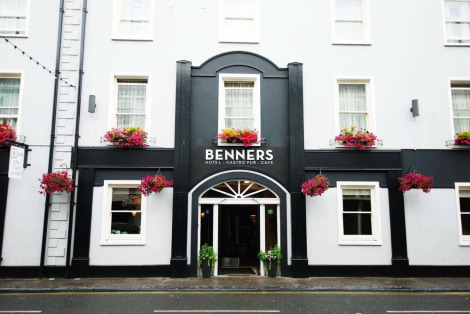 With a stay at Benners Hotel in Tralee, you'll be within a 5-minute drive of Aqua Dome and St. John's Parish. This hotel is 0.2 mi (0.3 km) from Wellspring Gallery and 0.3 mi (0.5 km) from Kerry County Museum. Stay in one of 67 guestrooms featuring LCD televisions. Complimentary wireless Internet access keeps you connected, and satellite programming is available for your entertainment. Private bathrooms with shower/tub combinations feature complimentary toiletries and hair dryers. Conveniences include phones, as well as desks and complimentary newspapers. At Brandon Inn, enjoy a satisfying meal at the restaurant. Quench your thirst with your favorite drink at the bar/lounge. At Brandon Inn, enjoy a satisfying meal at the restaurant. Quench your thirst with your favorite drink at the bar/lounge. The Manor West Hotel is located just a minutes walk away from the award winning Manor West Retail Park & Shopping Centre, housing names such as Debenhams, TK Maxx, Next and many more. The hotel is also in close proximity of championship golf courses and sandy beaches. With a stay at The Rose Hotel in Tralee, you'll be within a 15-minute walk of Aqua Dome and National Folk Theatre. This 4-star hotel is 0.7 mi (1.1 km) from Tralee Bay Wetlands and 0.8 mi (1.3 km) from St. John's Parish. Make yourself at home in one of the 64 individually decorated guestrooms, featuring iPod docking stations and DVD players. Your pillowtop bed comes with down comforters and premium bedding. Wired and wireless Internet access is complimentary, and flat-screen televisions with satellite programming provide entertainment. Private bathrooms with shower/tub combinations feature designer toiletries and hair dryers. This bed and breakfast is set at the heart of the Irish countryside, in Kerry. Located just a 10 minutes' driving distance away from Tralee Town, this property enjoys an aura of peace and serenity, surrounded by sheer, natural beauty. The property is located close to many attractions in the area. Guests can take a short drive to the coastal town of Dingle, where many activities and points of interest await. Guests can enjoy a range of activities nearby, including water sports, horse-riding and sailing. This wonderful property enjoys an elegant style. The guest rooms offer the perfect setting in which to completely relax and unwind at the end of the day. Guests will be pleased by the warm hospitality and excellent service that this property has to offer. With a stay at Gurrane in Tralee, you'll be within a 10-minute drive of Aqua Dome and Tralee Pitch & Putt Club. This bed & breakfast is 1.1 mi (1.7 km) from Kingdom Greyhound Stadium and 1.3 mi (2 km) from St. John's Parish. A beautiful, architecturally designed house in an exquisite rural setting, Ashville House sits just 1.5km from Tralee town. Recommended by the Michelin Guide, it showcases to guests the depth of County Kerry’s natural beauty. Only a 20-minute drive from Kerry Airport, guests can indulge in gorgeous breakfasts, including homemade brown bread and black pudding, and enjoy steaming power showers. Guests can explore Tralee's picturesque beaches, lively pubs, top notch golf and natural walking trails. Host Rose O’Keeffe shares her extensive local knowledge and wonderful hospitality. This bed and breakfast is set amidst leafy surroundings, in the mesmerising Kerry countryside. The lively town of Tralee, where culture and charm abound, can be found just 2 km away. The property is located close to Siamsa Tire, Ireland's National Folk Theatre and Arts Centre. Guests can explore the stunning Kerry landscape, where sprawling, sandy beaches, rolling hills and splendid walking routes are sure to impress. This property enjoys an elegant style. The guest rooms are tastefully designed, featuring classical decor and comfort. Guests can enjoy a wonderful breakfast in the mornings, before setting off to explore the area. On the far west coast of Ireland, on what feels like the very edges of the world, stands the close-knit and friendly town of Tralee. Set amid stunning landscapes of timeless beauty whilst stoically facing the wild grandeur of the Atlantic Ocean, Tralee is a magical place in an island renowned for its spellbinding charm. Tralee hotels offer the warm hospitality that exemplifies the chirpy informality of the Irish and cater to all budgets and requirements. For any visitor to these life-enhancing shores, a good craic with plenty of music and laughter is sure to be had. Famous the world over for the ‘Rose of Tralee' beauty festival, in which townspeople pick the prettiest girl in all of County Kerry, Tralee epitomises the authentic and mystical quality of Ireland that you may thought had been lost. However, simply walking along the majestic Banna Strand will confirm that the Emerald Isle has lost none of its lustre. You'll discover spectacular views of the sea and sweeping cliffs of the Kerry coast whilst visiting Fenit lighthouse, an evocative old structure made of hardy granite, standing defiant against the waves. After savouring Tralee's dramatic coastal vistas, you can find a peaceful corner amid the delicate and picturesque Victorian church in the town centre. Back in the bustle of the town, there's a wide array of shops and local cafés to satisfy anyone in need of some retail therapy. A quirky landmark is the Blennerville Windmill, a lovely way to spend the day with the family learning about the town's history whilst helping to make bread and enjoying some local produce. Wether's Well is an ideal spot for a quiet walk while Ballyseedy Wood is perfect for a brisk trek amongst dense woodland populated by wonderfully ethereal wooden statues. Ballyseedy is a forest where fairies, elves and mythical beasts abound. At the Rattoo Round Tower, one of only a handful still complete in Ireland, you can explore these fascinating buildings which are unique to Ireland. Used either as a holy retreat or a watchtower for Viking raids, no-one is certain about their original use. You'll be given a hearty Irish welcome at Kirby's Brogue Inn where you can enjoy delicious food and plenty of Guinness whilst surrounded by good cheer. For a taste of Tralee's vibrant nightlife, the Greyhound bar is an engaging place to start with popular Irish music and a log fire to get the night going. No visit to this deeply lyrical land is complete without an appreciation of its music. Siamsa Tire is home to Ireland's national folk theatre and is the ideal destination to experience the mystical power of Ireland's folkloric heritage. Indeed, anywhere in this intimate town full of mirth, good company and music is certain to reveal Ireland's special capacity to lighten the soul and lift the heart.